The Northern Rough Riders (NRR) are Scotland's premiere wild west reenactment & living history group. 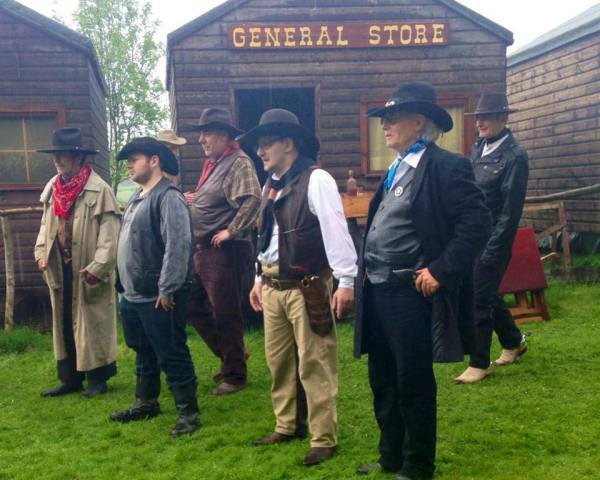 The chief aim of the group is to promote the history of the American Wild West (from about 1865-1900) through a mix of education & entertainment, & where relevant emphasising the role played by our Scottish descendants. Our members come from all over Scotland (...& a few from England). All NRR members are also proud members of Tranquility, Scotland's only wild west town. We meet regularly at Tranquility for rehearsals, film making projects, authentic weekends, shootouts etc. We are also regularly invited to attend local galas & major events all over Scotland. We are always on the lookout for new members to join us and share in this fantastic hobby! Joining could not be simpler, all you need to do is email us at [email protected] and we will send you an application form. Membership as of May 2016 costs only £30 per person per year. Membership fees pay for Public Liability Insurance, Membership of NARES and the general upkeep of Tranquility Wild West Town where we are based. Leave the stresses of everyday modern life behind, live the dream, experience the wild west and share your love of westerns with fellow enthusiasts!